Originally from Rockford, Michigan, Brian began his music career with the alto sax in grade school. His quest for music soon embraced drums, guitar, tenor banjo, fiddle, piano, concertina, and of course, mandolin, which he has played for more than fifteen years. In addition to performing, Brian has a passion for teaching. 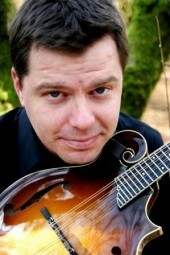 He instructs hundreds of students, teaches dozens of workshops each year, and is the founder of the annual River of the West Mandolin Camp. Brian brings a special and unique perspective to all of his students because he is a self-taught musician, spending hours playing, listening and pouring over hundreds of books and scores of sheet music.